Finally, home dental care for pets made easy and that works! Fight plaque, promote healthy gums, condition and deodorize gums, and give them the freshest breath. Plus it is tasteless and odorless — pets love it. No-brush solution for pet bad breath. Finally, pet home dental care made easy! Don't just mask pet bad breath; safely eliminate it at the source. By the age of 3, 70% of cats and 80% of dogs have some form of periodontal disease, which can take years off a pet's life. That's why we developed our innovative pet dental care line of products. They safely and effectively clean pets' teeth and gums, protecting them from periodontal disease, plaque, gingivitis and bad breath. Unlike other brands, our Pet Dental Water Additive and Pet Dental Gel are completely tasteless and odorless so even the pickiest dogs or cats can't detect it. We love pets, so all of our formulas are completely safe for both cats and dogs and 100% non-toxic. FRESH BREATH - Finally say good-bye to pet bad breath with fast-acting Oxygene®. We don't just mask bad pet breath, we safely neutralize it at the source. CLEAN TEETH AND GUMS - The easiest way to clean pets' teeth, fight periodontal disease, and strengthen their gum tissue. REDUCES PLAQUE & TARTAR - Helps reduce the risk of oral disease by providing daily advanced plaque and tartar control for dogs and cats. IMPROVES PET DENTAL HEALTH - This innovative. proprietary blend of safe and effective ingredients has been supporting and boosting pet health for over 30 years. SOOTHES GUM & MOUTH IRRITATIONS - Promotes healing by neutralizing bacteria and hydrating the tissue for a healthier pet. NO BRUSHING REQUIRED - It's so easy; just add a capful of our Pet Dental Water Additive to their drinking water each day. PETS LOVE IT BECAUSE IT IS ODORLESS AND TASTELESS - Our Pet Dental Water Additive is undetectable so even the pickiest pets even know it’s there. VETERINARIAN APPROVED - For over 30 years, vets have loved and recommended our innovative pet care products. NON-TOXIC - We use only the best ingredients; these formulas are completely safe for all pets and deliver results pet parents can count on. ALCOHOL FREE - Zero harsh chemicals so it won’t sting or irritate delicate gum tissue. IT WORKS - Trusted by pet parents to stop bad pet breath, and just like all Oxyfresh products, Pet Dental Water Additive and Pet Dental Gel for fresher breath and healthier pet teeth and gums are made in the USA with only the highest quality, non-toxic ingredients. Rub into the gum line with finger or apply to a toothbrush (if that is preferred) to deodorize, soothe, condition and clean teeth and gums. BONUS: More than a toothpaste! Our pet parents love to use it on wounds, too. Just apply to the affected tissue to soothe and condition. Give it a try. Taking care of your pet’s teeth is a must for their health and happiness. But, we get it! Tooth brushing is no easy task. That’s why there’s vet-recommended Pet Dental Water Additive. It takes the hassle out of pet home dental care. Just add 1 capful of this tasteless and odorless solution into your pet’s water bowl each day to freshen the breath and fight plaque buildup. Pet Dental Water Additive is safe and non-toxic, and best of all, no toothbrush required! 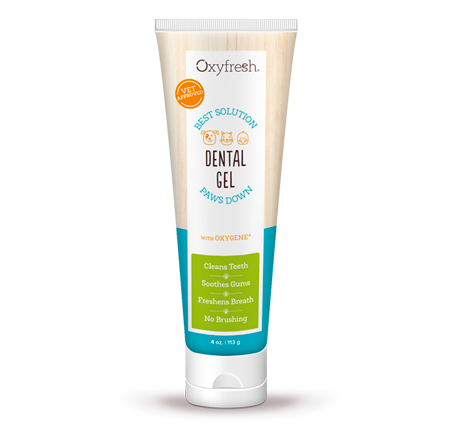 For those times when your adventurous pet gets a tooth or gum injury or just really bad breath, it’s Oxyfresh Pet Gel to the rescue. Made with soothing Aloe vera plus Oxygene®, Pet Gel is a treat for the gums as it deodorizes, stops plaque from forming, and helps to heal wounds and abrasions. It’s easy to use … rub directly on the gum line (or brush on if you prefer). Pet Gel is so versatile, it can even be used to soothe external wounds. Pet Dental Water Additive Ingredients: Water (Aqua), Stabilized Chlorine Dioxide (Oxygene®), Zinc Acetate, Sodium Citrate, Chlorophyllin-Copper Complex, Sodium Benzoate, Sodium Hydroxide, Citric Acid, Potassium Sorbate. Pet Gel Ingredients: Water (Aqua), Chondrus Crispus (Carrageenan), Stabilized Chlorine Dioxide (Oxygene®), Aloe Barbadensis Leaf Juice, Chamomilla Recutita (Matricaria) Extract, Methylparaben, Propylparaben. Have been giving to my 13 year old dog with unbelievable results. Her bad breath is gone gums are a nice pink color and tarter buildup is coming off, very happy with my find on the internet told people at work and they ordered also . please stay in business. only thing should have better shipping rates or bigger bottles of this product to save on shipping. Didn't think it would work but it does! My dog has a heart condtiion and cannot get her teeth cleaned. Needless to say she stinks! But after 3 days of drinking the oxyfresh solution in her water bowl, her breath is 100 times better and she has more energy too! Can't wait to see what a month does!! Thank you! Our little Maltese has had problems with her teeth from day one. Too many teeth, including some teeth that did not cut through her gums. She also had to have many teeth pulled due to gingivitis, abscesses. 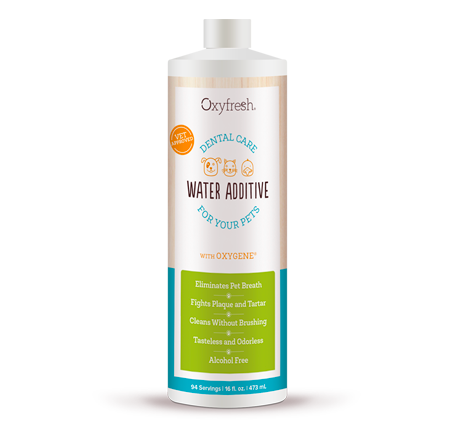 Since I started using Oxyfresh Gel and Oral Hygiene solution she passes her dental exams with flying colors. I bought 3 sets for myself but ended up handing them out to other fur mommies and singing praises of how my fur baby Bella has wonderful dental checkups. The biggest news, Bella's dentist said Bella has the whitest teeth she has ever seen on a dog. I have slowly moved over to using most of your pets product line and both myself and Bella love love love everything! Thank you so very much! After the vet told us that Charlie's teeth needed a professional cleaning we decided to give Oxyfresh Pet kit a try. Within a few days his gums stopped bleeding and the tartar and discoloration have nearly disappeared leaving his teeth nice and white.The Oxyfresh added to his water does not affect his appetite or health in any way. Why the vet told us the only solution was to put him under costly and risky anesthesia has us wondering what he really cares about. This product is already cleaning up my dogs teeth beautifully. I am very very happy with it. Luka is tolerating it and it took away his bad breath in no time. Awesome Product, we use to use it on our 2 poms, now we have a little rescue Chihuahua so wanted to use it again, And now live in Texas!